The Grey Cat is no more. He was not well. 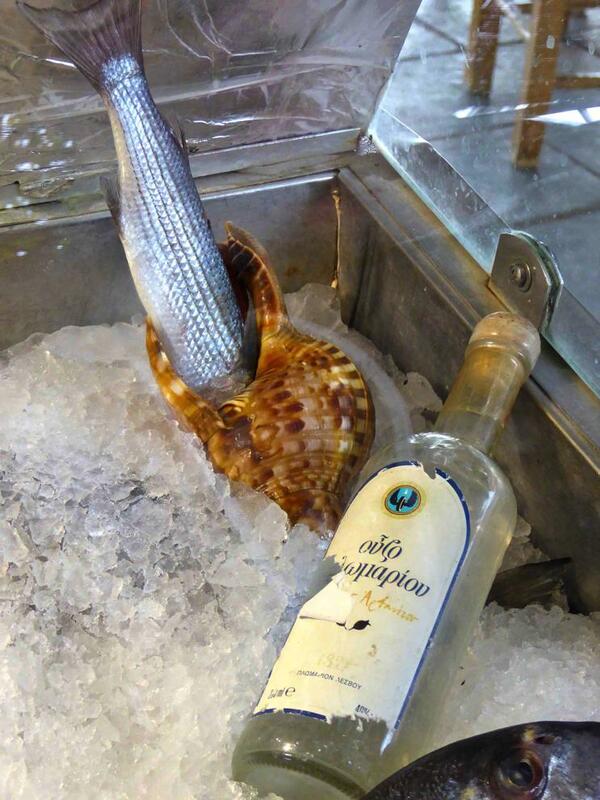 “We had,” said Stavros, “to take him to Loutro.” We know what that means. 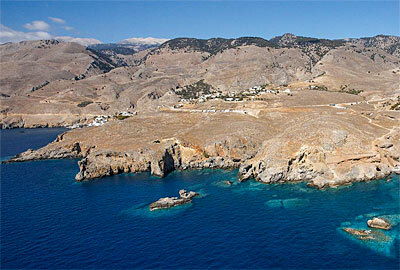 We recall at least two dogs who had to be “taken to Loutro” as well. But now we have the acolyte. The acolyte was the young cat who used to follow Grey Cat around everywhere, and copied everything he did. Grey Cat did not deign to take any notice, but he was very tolerant and never objected. These days, it is the acolyte who reigns in the old harbour, if not yet quite so magisterially. 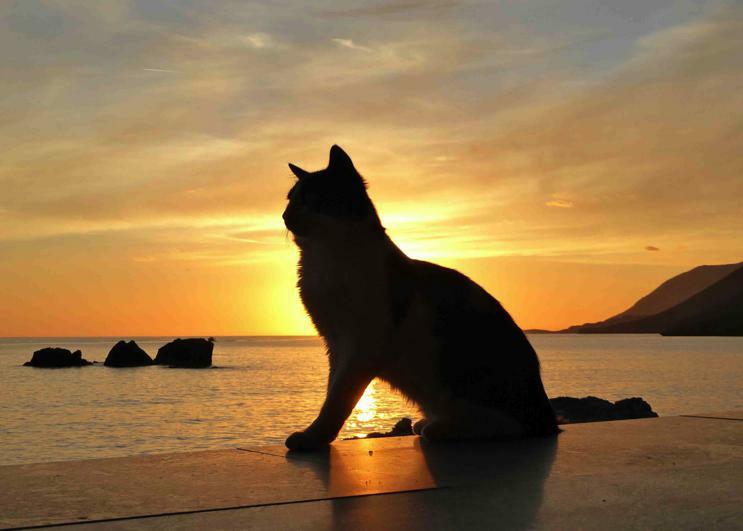 It’s the acolyte who greets tourists, with his tail up, as they walk along the harbour wall, and lets them pet him. And it’s the acolyte who sits on the wall of Stavros’s cantina in the evening watching the sunset. Today is November 2nd, and very sunny and warm. The acolyte is not interested. He is sitting on the edge of the old harbour wall, with his tail hanging over the edge, and his back to Stavros’s boat, which just happens to be moored immediately below and behind him. Stavros has just come in from his first fishing trip for several weeks, and is going through his many hundreds of metres of nets. His wife Julia and his father Barba-sifis are sitting on the wall watching Stavros as he works – rather admiringly, it seems. He has caught a lot of fish. There is no admiration, however, from the acolyte. Fish? Why would he be interested in fish? But notice how, just every now and then, the acolyte casually just throws a very quick glance over his right shoulder. But it can’t be denied that, mostly, he is staring resolutely in the opposite direction. With his tail hanging over the edge. He was 86. The village will not be the same without him. We spent about an hour with him last week. He was full of stories. He was, he said, not afraid of death. He had, after all, plenty of experience of both fear and death. – in the end all that happened was that he was kicked down the stairs. 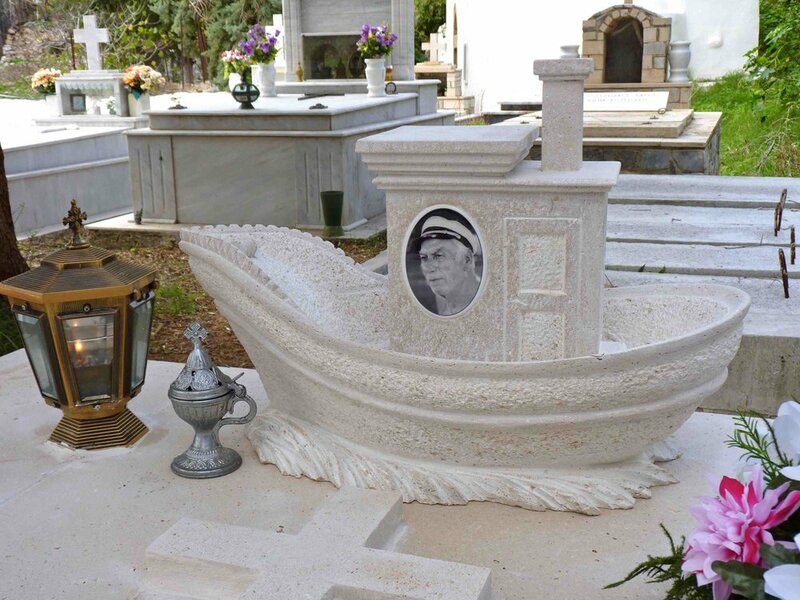 Very many people will remember his daily presence walking on the sea-front, and his regular fishing trips in his little boat. We will remember him, especially, having good times with his old friends Stelios and Manoussos and Andreas. Now, of the four old sailors, only Andreas is left. He has been dreading this day. We are so glad to have known Yannis. And to have learnt so much from him. No one is going to forget Barbayannis. It is dark. It is cold. It is windy. It is 9pm. It is very quiet indeed. It is just as Barbayannis used to say: “Here, in the winter, you take a Kalashnikov, you fire it all around” – here he would turn through 360º - “and you hit no one – NO ONE!”. But, be careful – tonight maybe you might. 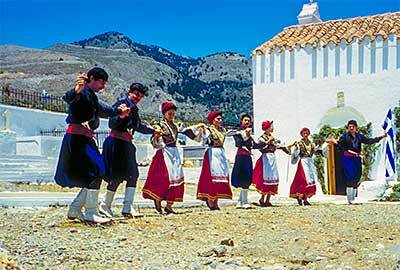 The Taverna Nikos, it is true, is now closed. But there are definitely a few people in the Delfini, sitting by the log fire. And please don’t shoot at Georgia’s cantina. We are in here with 6-7 other people – all men except for Jean and Georgia. It was very sunny in the village today, though it rained heavily in Chania. But the rain caught up with us after sunset, and it really poured for hours. There was even thunder and lightning. Now it has stopped, and we are glad to have made it here – we just enjoyed some of Georgia’s home-made cookies. There is no sign of Christmas except for a small artificial Christmas tree, opposite the sliding entrance door, decorated with small red, gold and silver ornaments. The heavy transparent plastic sheeting is in place all around, and the somba – the wood-burning stove – is giving off lots of heat. Our feet, knees, and faces are hot; but our backs are cold and we are wearing our coats. We are now drinking white wine, and eating chestnuts which Manoussos from the petrol station is roasting on the somba. The white cat with bent ear tips is curled up near the base of the stove, watching intently as the occasional chestnut pops off the top like a miniature bomb. When we came in, there was a competitive chorus of shouts demanding of Georgia that each member of the already-seated company be allowed to treat us. The competition was decided on the basis of seniority, with Mr G Perrakis the winner. Later, as others enter the cantina, I too join in the chorus of shouts by would-be treaters, but there is a pecking order here, and I am at the bottom. The only way to do it is to physically get your money to Georgia before anyone else does. Later, I do succeed in buying three beers. We have been here a week and that is the first alcohol we have managed to buy. There is lots and lots of conversation. When they talk to us, we understand. My views are being sought on Manchester United – I am English, so I must know. When we talk to them, they understand. But when they talk to each other, it’s like listening to a shortwave radio where the signal comes and goes. Right now, we have no idea who or what they are talking about. But it doesn't matter. It is most definitely not a good idea to be in the new harbour when the Daskalogiannis starts its engines these days. 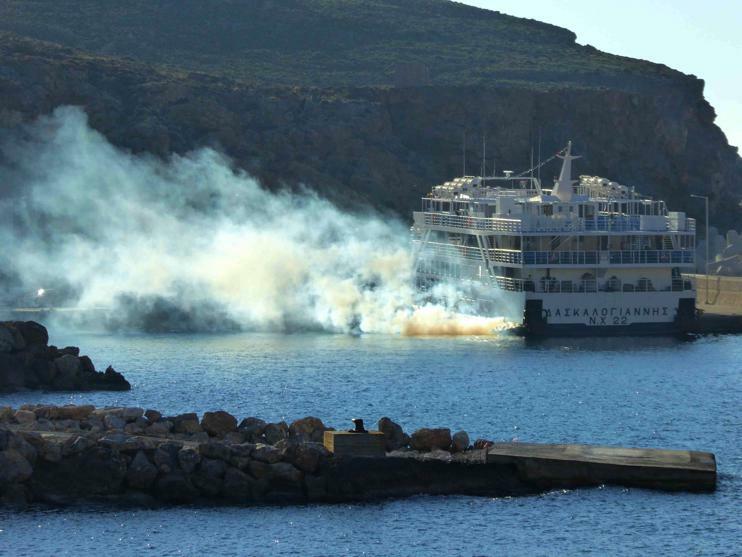 Smoke, white and black, billows out from the engines and hangs in the air long after the ferry has departed. We hope that, at some stage, some engine maintenance work will take place so that the bay will no longer periodically smell of diesel fumes. It is, on the other hand, a very good idea to be near the log fires and the wood-burning sombas in the restaurants and tavernas in the evenings. You will be warm. But you will leave with your clothes scented with wood smoke. The smell of wood fires is a general feature at this time of year throughout the village, in the mornings and evenings, and firewood is piled up randomly outside many houses. The only way you can avoid ending up smelling of wood smoke in the evenings is to go to Damoulis's bar in the plateia, which is heated electrically. It is a lively meeting place, and most nights it is full of young people, including the teachers, who gather there to watch the big-screen TV – although the channel is changed with such alarming frequency that few programmes, apart from football and basketball matches, can be seen in their entirety – or to play cards, or just talk, drink (not only alcoholic beverages), and eat snacks. But of course many of the clientele do smoke cigarettes. So you will go home reeking of cigarette smoke. What was I saying about cigarette smoke? The bar in the plateia in the village is absolutely nothing compared to this. You wouldn't call this a modest affair tonight. It looks to me like there must be 250 people here, all seated at long tables very close together. I suppose not all of them are smoking, but it seems like it. In front of us when we first sat down we found dolmádes, kalitsoúnia, spinach pies, meat-filled crepes, macaroni with ham, guacamole (guacamole! ), cheese, sweet fried pastries, pasta salad, meat pie, smoked pork, sausages, pita with peppers … and now after an hour a great deal of it is still there. This is a prógamos. It’s a pre-wedding party, and we are up in Imbros. It's the occasion when people come to donate food for an actual wedding – this particular one will take place on Saturday on the north coast, and well over 1,000 people will attend the reception. As we came into the taverna we passed a refrigerated van with a dozen lamb carcasses hanging inside, and about twenty live sheep in the back of pick-up trucks. After taking advice, we have donated something more modest – some special braided wedding breads from the bakery. Now they are serving the first of what we are warned are to be several main courses – goat – which is soon apparently to be followed by hare cooked in wine, braised lamb, roast lamb and potatoes, boiled lamb, and rice piláfi with yoghurt. The boys who are bringing the food, some of them familiar faces from down in Chora Sfakion, are operating in impressive teams of two. As they squeeze down the aisles, one supports a large heavily loaded tray on his shoulder and out along his extended arm, while the other lifts the new plates of food off the tray and places them on the table. If there is no room, they are just putting them on top of plates of food which are already there. The piles are getting higher. The man who is to be married, and various members of his family, are circulating among the guests thanking them for coming, as well as for their gifts; and everyone is drinking to everyone else’s health and happiness. The fiancée has also just turned up to thank the guests – a surprise, as the older tradition was that she would not attend the progamos. People are still coming in three hours after we arrived. It is very noisy. Much of this is down to shouting, as men pour koúpes – tumblers full of excellent local brown wine – and send them down or across the tables to recipients who are supposed to drink them down in one go. I have been defending myself stoutly, and successfully so far, against becoming involved in this practice. We love Cretan music, but we are not, to be honest, completely sure about these particular unaccompanied vocal renditions of rizítika by men who have had perhaps too many koúpes. It is very hot in here. We are relieved that Markos, who has brought us up to Imbros, has said he does not intend to stay late. Only time will tell, of course, what “not late” means. It is getting rather late, down here at the Lefka Ori. I have no idea what the time is, and can’t think of any reason for looking at my watch. We have been here in the village for three weeks, and time is getting less and less important. The lights are off at the Xenia. The lights are off along most of the sea-front. Though if I can summon up the energy to turn my head, I can see that there are still some customers down at Déspina’s. It is extraordinarily peaceful. There is just enough movement of the sea in the harbour to mask other noises except, every now and then, for an occasional guffaw from the local boys at the table in the corner. Most of the tourists have finished their meals and gone. But we are hanging on here, too full to move after our fresh fish and lamb chops. We are vulnerable, therefore, to the occasional “raki attack”, but we are fending them off fairly well with, we hope, good humour and good grace. Now, and strangely for this time of night – or for any time, for that matter – Yorgos has started walking around rather animatedly, and causing quite a disturbance. It looks, from where we are sitting, as if he is attacking the fresh fish display unit. Yes – I have to make the effort to lean forward slightly to see this – what he is doing is chipping vigorously away at all the ice in the unit and loosening it up. Now, he moves into a new phase. He is putting the discarded ice into a small bucket, walking over to railings at the edge of the harbour, and throwing the ice into the sea. He does this several times. On his next pass, he calls over to us. 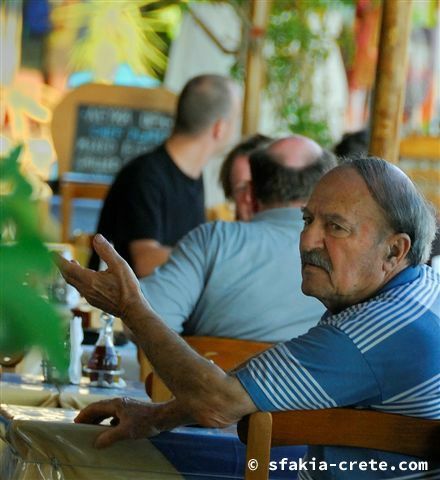 He opened the Lefka Ori taverna in 1971. Every year for the past 44 years he has stood in his kitchen, cooking and serving up his wonderful moussakás and all the other delicious food people come to his taverna for. Forty-four years, seven months a year, 14-16 hours a day. 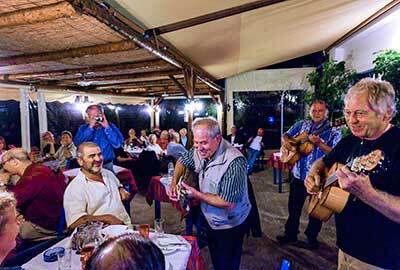 The taverna closed for this season on Friday night. Saturday was spent putting away furniture and cleaning, with help from the three Bulgarian workers and his sons. We knew the job was finished when Andreas put the canary cage in his car and headed home at 5pm. Yesterday, Sunday, it rained from time to time. But today it is glorious: sunny, hot, a light breeze, a gentle swell on the sea, with some clouds over the mountains. However bad the weather is elsewhere in Crete, the local people here are often inclined to suppose that they will probably be exempt from it. Here, it is állos kósmos – ’another world’. And today they are right. 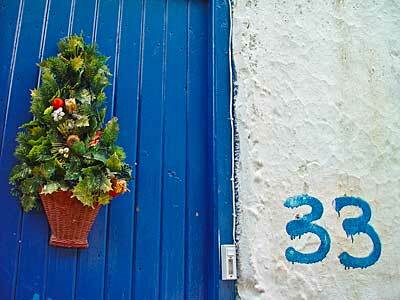 Today, although the taverna is closed, the door to the magazí is open. It is open because that is where Andreas is spending his morning. Today Andreas has a very big smile. He has his coffee in peace. Today he has a whole stack of history books ready to read during the winter. Today he has his boat and his fishing tackle to prepare. Today he has five months ahead of him free from standing in the kitchen and cooking. Sadly, he no longer has Barbayannis to pass the time with in the winter. That is a great and terrible sadness. But those spells out in his fishing boat will, he says, “clean my mind”. I say that I am sure he will enjoy the fishing and the reading. He says Ti na kanoume? – ‘what are we to do? But he is going to do OK.
Today he looks really rather happy. “It was exactly forty years ago,” says Andréas. “Forty years today”. We are not sure what he is talking about. He points to the southern horizon: “It was the same weather as today”. Now we get it - we remember the story. Today is dull and overcast, as it was then, apparently – we were not here at the time, but we have heard about it often enough. There is an enormous swell on the grey sea, rolling in dramatically from the southeast with the wind. This is the sirókos which is blowing in, bringing with it warm air and, if it rains, maybe red Saharan dust. As Andréas says, on April 3rd, 1979, the weather was the same. We did not hear about what happened that day untl the following year. But it was a truly traumatic and horrifying event which no one who was here at the time – most of them aged over fifty now, of course – will ever forget. In those days we had not heard of the word tsunami. But that is what it was. 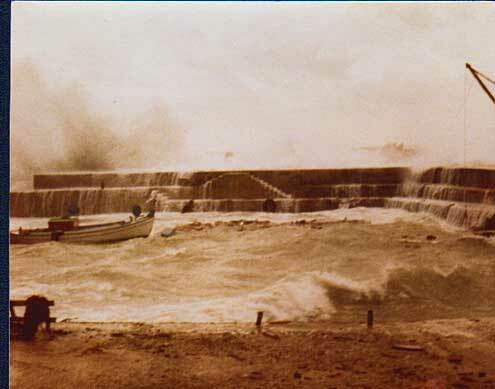 The water was suddenly all sucked out of the old harbour, Andréas now reminds us, and a gigantic wave then surged back in again, towering over the sea-wall and smashing into the colourful fishing boats in the little harbour, which were all destroyed, and breaking into the shops and tavernas along the front. The most frightful thing, though, was that many people were swept helplessly into the harbour. Andréas had painted the dramatic scene for us when we next returned: “Three times Andréas go in the sea,” he told us. He had been dragged into the water by the tidal wave, but then, having rescued himself, he had twice dived back in again to pull out some people floundering in the sea, breaking his arm as he did so. Miraculously, no one was drowned, but at least one tourist was badly hurt. Now, in 2019, Andréas is opening up his kitchen again for the first time this spring, and everyone is wishing the Lefka Ori taverna “kalí saizón!”. Andreas is making psarósoupa, fish soup, and – of course – moussakás. We ask, as we do jokingly every year, if he still remembers how to make it. Oh yes, of course he remembers. Just as every year he will remember April 3rd, 1979.